The present study explores the strength of the relationship between offending and victimization among young adolescents. We focus especially on the role background characteristics such as gender, immigrant background and family structure and causal mechanisms such as risky lifestyles and low self-control as many scholars have argued that the correlation between offending and victimization may be caused by common characteristics of offenders and victims. 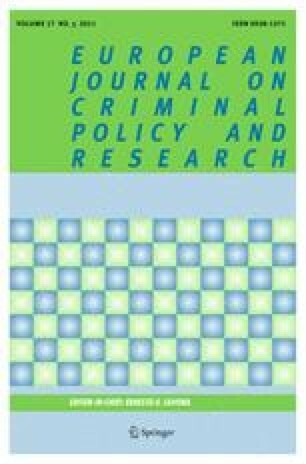 The article build upon two large-scale self-reported delinquency studies in Sint-Niklaas (Belgium) and Halmstad (Sweden). The correlation between offending and victimization is strong, even when controlling for demographics, lifestyles and low self-control. However, the lifestyle and low self-control model predicts offending better than victimization and the independent effect of offending on victimization is larger than the independent effect of victimization of offending. The same pattern is found in both samples, suggesting the stability of findings. The implications of these findings are discussed. (2) How often are you out in the streets, car parks etc? (3) how many times where you drunk in the past twelve months? (3) how many times during the past year have you been very inebriated as a result of drinking alcohol? *p < .05; **p < .01; ***p < .001. *p < .05; **p < .01; *** p < .001. Childs, K., Gibson, C. (2009). "Low self-control, lifestyles, and violent victimization: Considering the mediating and moderating effects of gang involvement" Paper presented at the annual meeting of the American Society of Criminology, Royal York, Toronto < Not Available>. 2009-02-05 from http://www.allacademic.com/meta/p32216_index.html (27-04-2009). Nofziger, S. (2007-11-14). "Integrating Self-Control and Lifestyle Theories to Explain Juvenile Violence and Victimization" Paper presented at the annual meeting of the AMERICAN SOCIETY OF CRIMINOLOGY, Atlanta Marriott Marquis, Atlanta, Georgia Online < PDF>. 2009-02-03 from http://www.allacademic.com/meta/p200176_index.html. Shaffer, J. N. & Ruback, R. B. (2002). "Violent Victimization as a Risk Factor for Violent Offending Among Juveniles", Juvenile Justice Bulletin, http://www.ncjrs.gov/html/ojjdp/jjbul2002_12_1/contents.html (12-03-2009). Smith, D. J., McVie, S., Woodward, R., Shute, J., Flint, J. & McAra, L. (2001). The Edinburgh Study of Youth Transitions and Crime: Key findings at ages 12 and 13, 209 p. http://www.law.ed.ac.uk/cls/esytc/findreport/wholereport.pdf (18-03-2009).